Cilia are hair like organelles, protruding from virtually any polarized cell within the human body1 where they serve very diverse functions during development, tissue morphogenesis, and homeostasis like signal sensing2, flow generation and protein transport3,4. Due to these divergent functions, diseases caused by malfunction of cilia, the ciliopathies can manifest with various symptoms affecting many organs5. One of the most specialized cilia within the human body is the photoreceptor outer segment. Here, the cilium is not only a sensory organelle for light perception but also serves as a transport highway representing the only connection between the inner and outer segment of the photoreceptors (interconnecting cilium). Because there is no biosynthesis within the outer segment, all material needed, must be transported via the interconnecting cilium. As a consequence of this essential function within photoreceptors, malfunction leads to severe impairment of vision, which is one of the hallmarks of most ciliopathies6. A prerequisite for normal ciliary function is the interplay between protein machineries within and associated to the cilium. Understanding the assembly and the interplay of these machineries, consisting of multiple protein complexes within the ciliary network is therefore essential to understand ciliary function in health and disease (Figure 1). To contribute to this, I developed and applied different approaches to not only identify the network components and their interconnectivity but also to detect alterations induced by disease causing-mutations7-10. a) Qualitative analysis of protein complexes by SF-TAP. The protein of interest, fused to the SF-TAP tag is used to isolate the protein complex by two-step purification strategy. The identity of the protein complex components is determined by mass spectrometry. Based on the complex components, the function of the protein of interest can be exerted. b) Quantitative analysis of protein complexes. The protein complex of the target protein, compared to a control is analysed by one-step purification combined with SILAC. Alternatively the same experiment can be performed comparing the interactome of a mutated form of the protein to the wild type protein. Possible alterations give insights into the disease mechanism of a mutation. c) Validation of the data from a) and b) can be done in cell culture and animal models13. Lebercilin, for example, is one of the ciliary proteins and is mutated in Leber congenital amaurosis (LCA), a severe form of inherited blindness, affecting children very early in life11. By quantitatively comparing the protein complexes formed by wild type and LCA-associated mutants using affinity purification and quantitative mass spectrometry, I could show that both mutations analysed lead to a complete loss on binding to the intraflagellar transport machinery (IFT) (Figure 2). The IFT is one of the essential ciliary protein transport mechanisms and its malfunction leads to heavy impairment or even loss of photoreceptor outer segment formation. This explains why the loss of interaction between Lebercilin and the IFT leads to impairment of ciliary transport within photoreceptors and ultimately the loss of outer segments and therefore blindness12. The approaches, used for the dissection of the Lebercilin complexes are currently applied in higher throughput to the whole ciliary protein network (www.syscilia.org) to try to understand principle ciliary functions and especially malfunction on the molecular level of protein interactions that lead to the manifestation of disease. To achieve this, protein complex analysis is combined in a systems biology based project with different other omics technologies and bioinformatics analysis to handle and integrate the large amounts of data generated. Figure 2: Loss of IFT association to the Lebercilin protein complex. Data obtained by quantitative protein complex analysis and comparison are represented. All proteins identified to be part of the Lebercilin protein complex are shown. Proteins, showing loss of binding to both Lebercilin-p.P493TfsX1 and p.Q279X are shown in red. Blue lines show the interconnectivity as determined by the IFT88-SF-TAP analysis. Due to both LCA-associated mutations analyzed, the interconnectivity of Lebercilin and the IFT complexes gets lost. Greenwood, M. On Retractile Cilia in the Intestine of Lumbricus Terrestris. J Physiol 13, 239-259 (1892). Hirokawa, N., Tanaka, Y., Okada, Y. & Takeda, S. Nodal flow and the generation of left-right asymmetry. Cell 125, 33-45, doi:10.1016/j.cell.2006.03.002 (2006). Jain, R. et al. Sensory functions of motile cilia and implication for bronchiectasis. Frontiers in bioscience 4, 1088-1098 (2012). 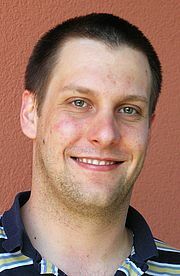 Kinzel, D. et al. Pitchfork regulates primary cilia disassembly and left-right asymmetry. Dev Cell 19, 66-77, doi:10.1016/j.devcel.2010.06.005 (2010). Badano, J. L., Mitsuma, N., Beales, P. L. & Katsanis, N. The ciliopathies: an emerging class of human genetic disorders. Annu Rev Genomics Hum Genet 7, 125-148, doi:10.1146/annurev.genom.7.080505.115610 (2006). Estrada-Cuzcano, A., Roepman, R., Cremers, F. P., den Hollander, A. I. 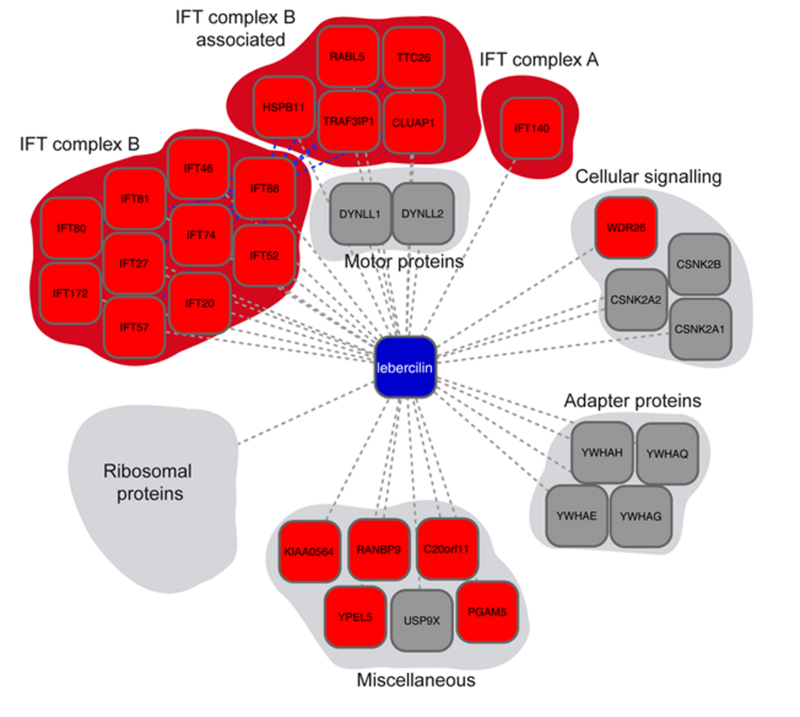 & Mans, D. A. Non-syndromic retinal ciliopathies: translating gene discovery into therapy. Hum Mol Genet 21, R111-124, doi:10.1093/hmg/dds298 (2012). Gloeckner, C. J., Boldt, K., Schumacher, A., Roepman, R. & Ueffing, M. A novel tandem affinity purification strategy for the efficient isolation and characterisation of native protein complexes. Proteomics 7, 4228-4234, doi:10.1002/pmic.200700038 (2007). Coene, K. L. et al. The ciliopathy-associated protein homologs RPGRIP1 and RPGRIP1L are linked to cilium integrity through interaction with Nek4 serine/threonine kinase. Hum Mol Genet 20, 3592-3605, doi:10.1093/hmg/ddr280 (2011). Vogt, A., Fuerholzner, B., Kinkl, N., Boldt, K. & Ueffing, M. Isotope coded protein labeling coupled immunoprecipitation (ICPL-IP): a novel approach for quantitative protein complex analysis from native tissue. Mol Cell Proteomics 12, 1395-1406, doi:10.1074/mcp.O112.023648 (2013). Texier, Y. et al. EPASIS: Elution profile analysis of SDS-induced sub-complexes by quantitative mass spectrometry. Mol Cell Proteomics, doi:10.1074/mcp.O113.033233 (2014). den Hollander, A. I. et al. Mutations in LCA5, encoding the ciliary protein lebercilin, cause Leber congenital amaurosis. Nat Genet 39, 889-895, doi:10.1038/ng2066 (2007). Boldt, K. et al. Disruption of intraflagellar protein transport in photoreceptor cilia causes Leber congenital amaurosis in humans and mice. J Clin Invest 121, 2169-2180, doi:10.1172/JCI45627 (2011). Texier, Y., Kinkl, N., Boldt, K. & Ueffing, M. From quantitative protein complex analysis to disease mechanism. Vision Res, doi:10.1016/j.visres.2012.08.016 (2012).